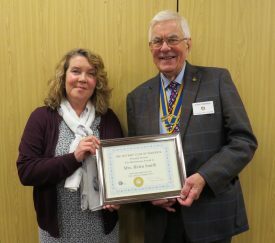 The Rotary Club of Warwick presented its annual Meritorious Service Award to Helen Smith at their meeting on Wednesday January 17th, in recognition of her work for the local community. Rotarian Jackie Crampton introduced Helen to the club as a remarkable young woman who has ensured her daughter Evelyn will be remembered, by her initiatives to help others. Helen lost her daughter Evelyn Mary Smith in 2013 at the age of 7. In 2014 she set up the charity “Evelyn’s Gift” to undertake “little acts of kindness” for those in need, and to train as many people as possible in lifesaving CPR. This caught the imagination locally and received support from the Mayor’s charity enabling many local primary school children to be taught CPR by the local Community First Responders. Since 2015 nearly 5,000 people have been trained in CPR through a collaboration between Evelyns Gift, Warwick District Community First Responders and Waterside Medical Centre in Leamington Spa. Helen has now secured charity status for this as “Warwickshire Hearts”. Colouring packs, books & a TV for children visiting relatives at Myton Hospices; Room and garden makeovers at St Michael’s Hospital & Marloes Walk nursing home; Regular deliveries of toiletries, underwear and support to Homeless shelters, Refuges, to Young People and women with Breast cancer; Bereavement packs to local schools. Recently Helen was invited to attend a conference “learning from deaths”, held in London, and campaigns to eliminate a culture of denial in the NHS. Without discovery of the truth, we cannot learn from mistakes. President John Hibben expressed admiration for Helens tireless work on behalf of the community of Warwick, and presented her with a framed certificate and cheques for £200 towards the work of Evelyns Gift and Warwickshire Hearts. Anyone interested in being trained in CPR can contact Warwickshire Hearts via www.warwickshirehearts.org. or Evelyns Gift via www.evelynsgift.co.uk.